The SCA’s period of interest is primarily the Middle Ages from about the time of the fall of the Roman Empire to the end of the Renaissance (pre-17th century). This spans about a thousand years or so of history but some people also include ancient cultures. The areas of interest are primarily European, although we also include any culture which had regular contact with Europe during this time period. The SCA is primarily a group of people interested in the study and re-creation of pre-17th century life and culture. It is much more than a study group. We learn by doing. For example, rather than simply reading about armour of the period; we read about it, look at surviving examples, consult with others, and then attempt to learn the medieval techniques by actually making armor. We then take it a step further – we take our creation onto a field of battle and use it for protection in armoured combat. The same is true of clothing, needlework, leatherwork, carpentry, cooking, etc. If it was done in the Middle Ages, chances are good that someone in the SCA does it! The ideals of medieval society were based on honour, chivalry and courtly behaviour. These are the ideals emphasized in the tales of King Arthur. However, history tells us that these concepts were more frequently ideals to strive toward rather than actual practice. The SCA is filled with people who hold these ideals dear. Our system of combat, for example, is based on the honour system. There are no referees to determine a winner or loser. A person who has been struck a blow which would have disabled him or her had the weapon been real, declares that he or she has lost. In other words, it is up to the honour of the combatants to determine the outcome of the fight. In the SCA, you will find a great many people who wish to lend a hand simply because it makes them happy to do so. This is one means of adhering to the “code of chivalry” talked about in the tales of King Arthur; help those in need. Everyone in the SCA is considered to be of “gentle birth” because most people wouldn’t find being a peasant very much fun! People will refer to each other as “My Lady” or “My Lord” instead of “Hey you”. Treating others with kindness, courtesy and respect is emphasized in the SCA. In the SCA, you get to leave the 21st century behind for a couple hours or a few days. You are known mainly by the name you choose for yourself and by your actions within the organization. We each adopt a persona—a name and personal background which could have existed in the Middle Ages—we do it to give us a basis for historical research and re-creation. This gives the workings of the SCA an element of imagination; we require that the persona be plausible within the context of history. Rather than being Tom, a university student, you can be Gunnar, a Norseman who owns a ship and sails the sea in search of adventure. Rather than being Jennifer, a senior manager, you can be Elizabeth, a 14th century daughter of a wealthy noble. We step into the lives of the people we create; people who could have existed during in pre-17th century Europe. In doing so, we tend to learn about ourselves, our dreams, our hopes and our ideals. 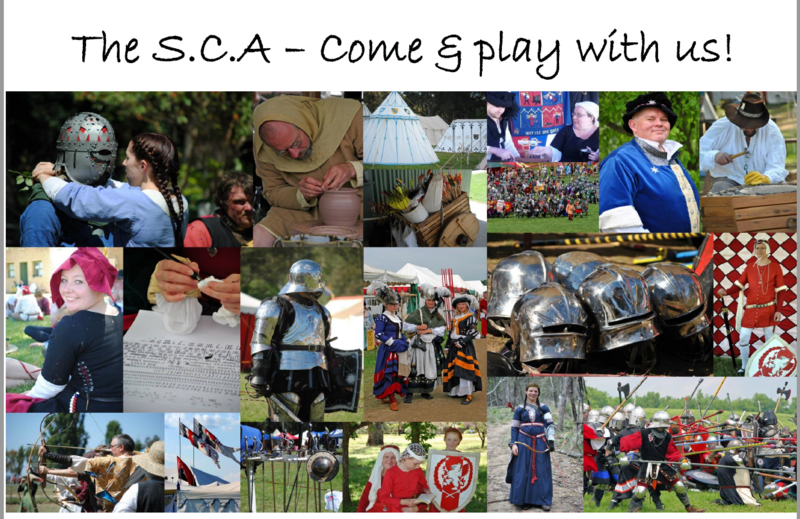 Within the SCA, you get to meet a large number of people from all walks of life. SCA people include students, factory workers, doctors, teachers, lawyers, professional athletes, secretaries, homemakers, military personnel, children, senior citizens…’tis a very diverse group. This diverse group of people share common interests in the Middle Ages. We come together to re-create the best parts of the time period—the arts, culture, combat and festivities. One cannot help but learn about medieval life along the way. The main goal is to enjoy ourselves while learning. Who cannot have fun while spending time with a group of friends singing and telling tales of glory, feasting, shooting archery, engaging in combat on the field of honour, and admiring each other’s crafts? The Middle Ages were unfortunately a period in history which men and women weren’t equal, society was strongly stratified according to the socioeconomic class into which a person was born, and religious intolerance abounded. The SCA does not re-create these aspects of the Middle Ages. Both men and women have equal opportunity to participate in any of the activities. On the field of combat, men and women fight each other or side by side. Similarly there are no divisions according to gender on the archery field. It is also not at all unusual for a man to take up cooking, embroidery, sewing or any other craft which would have traditionally been thought of as “women’s work”. At the same time, women frequently make armor, do leatherwork, craft weapons, and do other things which traditionally were thought to be the province of men. We do have titles and ranks in the SCA, which are awarded by our King and Queen. The highest honour is to become a Peer of the Realm. Anyone can achieve this honour (or any other honours) through consistent hard work and demonstration of chivalric behaviour within the SCA, no matter what the person’s position outside of the organization. In order to avoid misperceptions by the general public about “the people in the funny clothes” and the conflicts which can arise from religious differences, our organization’s governing documents specifically forbid practicing any sort of religion at our functions in such a way that others will inadvertently included. This means that you’re, of course, welcome to observe your own religion in the privacy of your encampment, but religious activities are never a part of our meetings, functions, or events. You may choose the persona of a nun or monk, but you may not attempt to preach or “convert” a person while participating in SCA activities. Part of the beauty of the SCA is that our members are from a diverse body of nationalities, ethnic origins, religions, abilities, disabilities, socioeconomic statuses, personal philosophies and ages. Discrimination is against our ideals, and we enjoy the diversity which comes with such a broad base. We enjoy being able to meet, share a common interest, and become friends with so many different people.